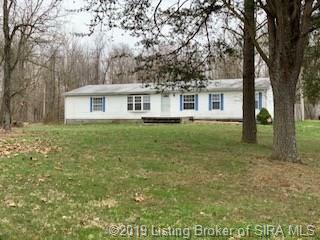 Updated Modular home located on 2.5 acres and backs up to wooded areas. This 3 bedroom 2 full baths home has new paint throughout, updated bathroom vanities and ceiling fans. Large fenced backyard suited well for entertaining family & friends on relaxing in the peaceful yard. Schedule your showing today! Directions: From I-65n Take Exit 19 Onto In-160 Toward Henryville. Turn R Onto Colonels Way W Towards Henryville. Then Turn L Onto N Ferguson St. Go 5.6 Miles & Turn R On E Radio Tower Rd. 0.7 Miles, Turn L Onto S Underwood Rd And Destination On R.